The first half of my Thailand coverage will be focusing on the wonderful tourist venues, markets and spiritual centers in Bangkok. There is really so much going on in the beautiful country that it�s hard to know where to start and stop. Initially, it is important to be centrally located in Bangkok, with the amenities you appreciate, depending on your budget constraints. The Hilton Sukhumvit � DoubleTree by Hilton are in the middle of everything, and offer simple transportation options to go everywhere. Their concierge will assist you with reservations, tours and what ever else you require. 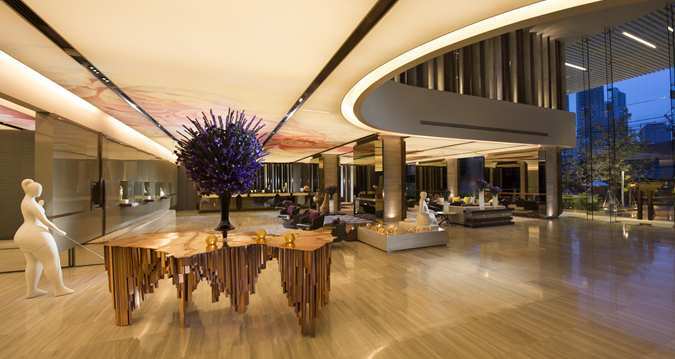 Both hotels offer an amazing breakfast buffet that includes everything familiar with additional Thai offerings, and the Hilton has a charming Italian inspired restaurant for dinner. 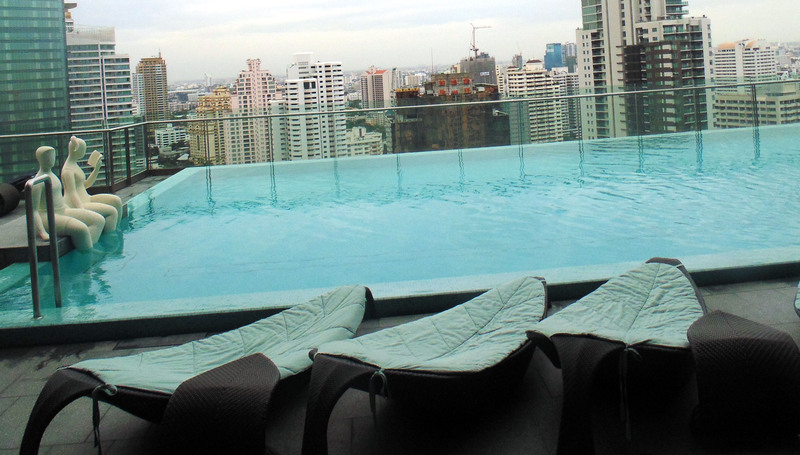 They also have a splendid pool that overlooks the city; a great place to relax after a long day of shopping or sight seeing. www.hiltonhotels.com. Ideally, it�s always right to talk shopping with people on the go to a new destination, and shopping at the local markets in Bangkok is amazing. So many markets - so little time. I enjoyed the Food Market, which along with an amazing collection of Thai foods and cooking materials, also had clothes and jewelry that was affordable and attractive. Some market recommendations from market shoppers included Pak Klong Flower Market, Bo Be Tower Clothing Market, Chatuchak Weekend Market and Klong Toey Fresh Market. These markets are also perfect venues for photography buffs. 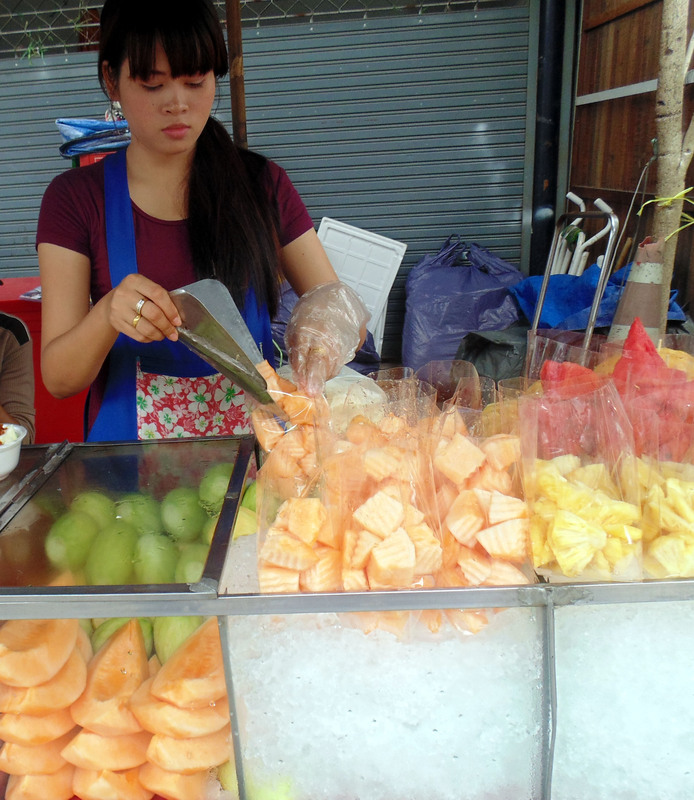 The largest market in Thailand is the Chatuchak Weekend Market, featuring 15,000 stalls of everything under the sun. From darling clothing designs to shoes, jewelry, artwork, underwear and an endless variety of things to eat and drink it is all exciting, exhausting and fun. I love the variety of desserts and food specialties at this market; from Paella in a huge cooker to coconut ice cream, along with fresh fruit or curry dishes. No one got sick on the street food, it�s all good, and I found some very nice gifts to take home to family and friends at this market, and a few cute bracelets for myself. For maps and locations of markets visit: www.bangkok.com/shopping-market/. When they suggest you bring an umbrella to Thailand it is not because you may get caught in a monsoon (of course, you could), it�s to protect you from the very hot sun! A good sun screen and bug spray are also something you will need, however, they have pharmacies everywhere that sell all these things. Most hotels give complimentary daily bottles of water, and you will need lots of water to stay hydrated. 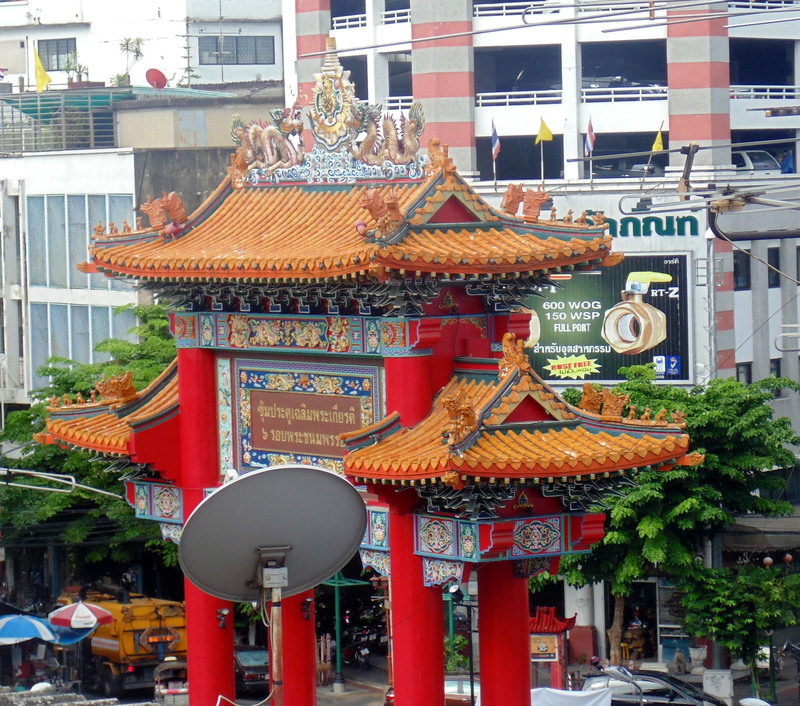 Don�t forget there are also fantastic shopping centers in Bangkok that can be easily accessed by the train systems. They are beautiful, multi-leveled and carry all the designer goodies we all know and love; only they seem to have more items and a different selection in Bangkok. The chic centers usually have a whole floor of foodvenues to choose from, offering great and affordable food. Try Centralworld shopping center, and look for a super restaurant called Taling Pling Thai Gastro Caf� for some unique Thai tastes. Centralworld was the location of Thailand Happiness Street Festival during my visit, and included participation by many countries, Thai tourism officials, food and beverage experts and Thai celebrities filled the conventions center and street. The street was literally rockin� and the sky was filled with thousands of colored balloons. www.centralworld.com. What about the Wat! 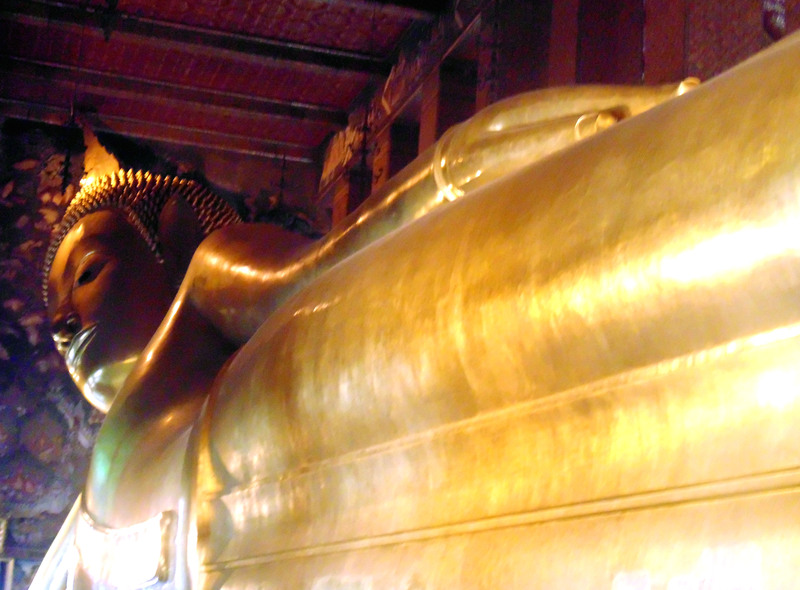 Well, the holiest places in this city have names that begin with Wat, which are actually temples, where monks live. 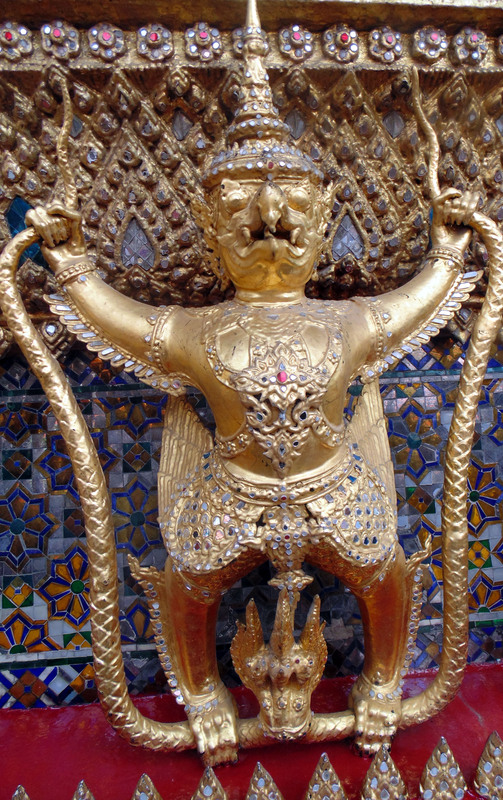 Bangkok�s temples are a unique part of the capital�s heart and soul. A visit here would not be complete without visiting two or three of them. The architecture and artwork is like no other and each contains thousands of pieces of colored glass and pottery with intricate gold gilding. Bangkok is known as the City of Angels, and I really appreciated this being from the Los Angeles area. There are many exquisite temples, where people have worshipped for many years, and tourist clamor to share their special vibrations and beauty. 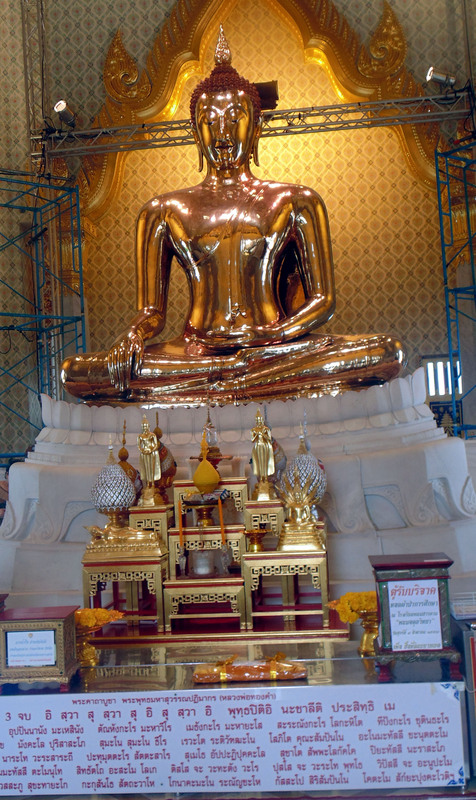 The artwork in these temples is so beautiful, and the Buddha�s, such as the Wat Trimit, a solid Golden Buddha and the Wat Po, huge reclining Buddha are breath taking in size and elegance. Visitors can have a lovely view of the China Town gate from the Golden Temple. 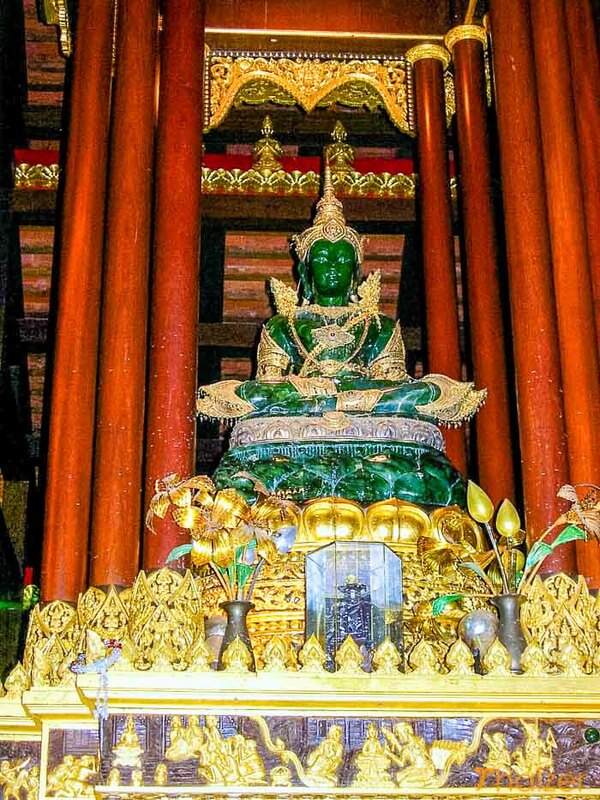 The Emerald Buddha in the exquisite Wat Phra Kaew Royal Chapel of the Grand Palace is considered to be the most revered, and attracts thousands of visitors each year. www.TourismThailand.org. 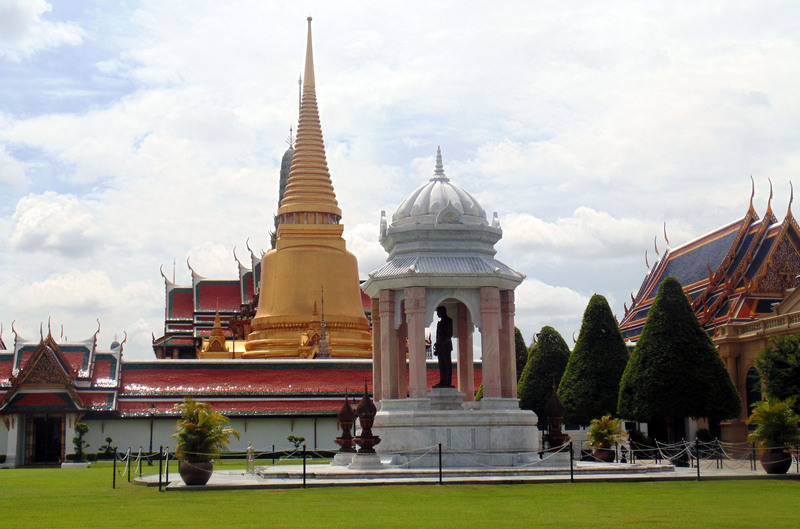 The Grand Palace is made up of numerous buildings, halls, pavilions that surround open lawns, gardens and courtyards. Additions and rebuilding done by successive reigning Kings over 20 years explains the eclectic styles. The Grand Palace is now partially open to the public as a museum, but remains a working palace, with several working royal offices inside. 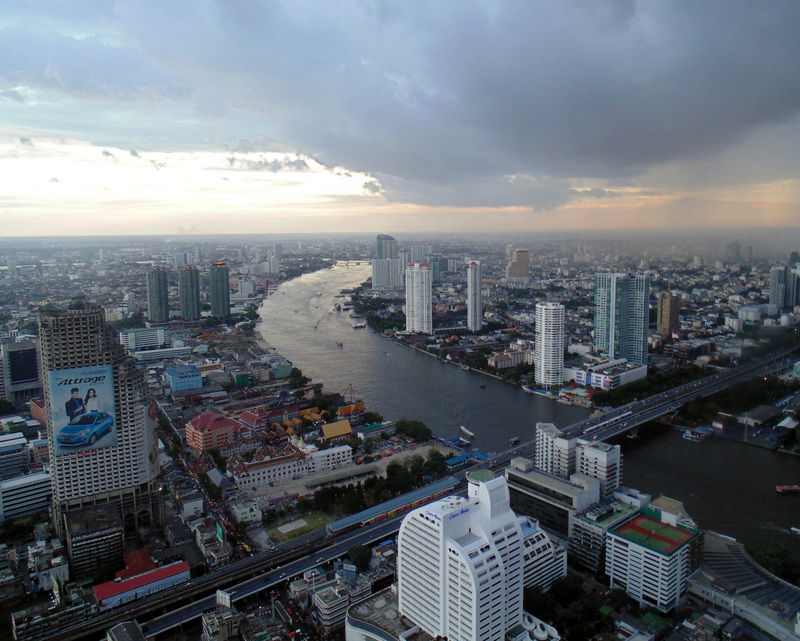 The Chao Phraya River runs by the Grand Palace. The River of Kings in Bangkok is so lovely and winds through the city with a grace I have rarely seen in any other location. The top of the Lebua Hotel is the ideal place to relish this heavenly view of the river. www.lebua.com. If you are a Thai foodie, no trip to Thailand would be complete without a cooking lesson from a star chef. My cooking adventure was spent at a charming French-colonial style river residence, where Tam, owner/instructor at Amita Cooking School, spent an afternoon teaching my group about the herbs and plants in her garden, and giving us a hands-on cooking lesson, followed by a delicious four course lunch that we contributed to. Outstanding experience for visitors to Thailand. 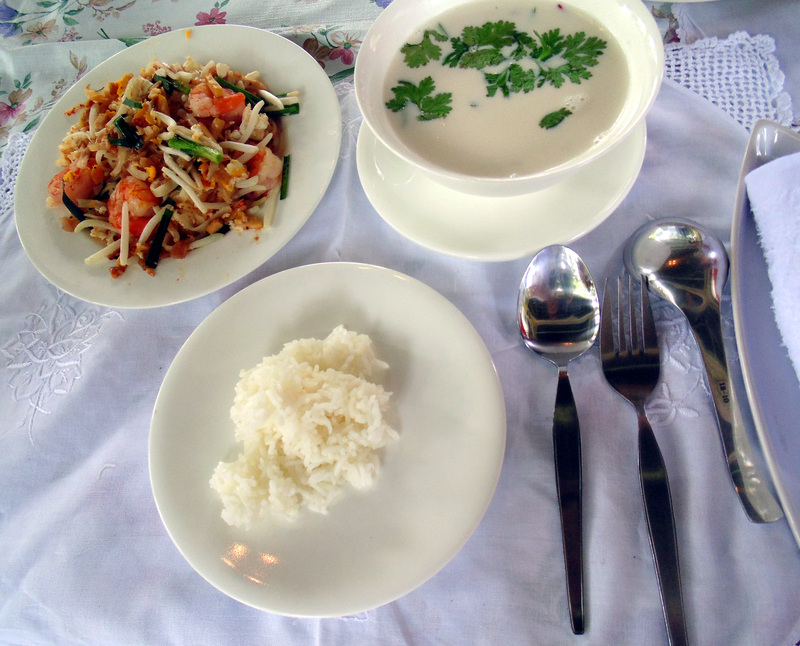 I will think of this every time I make her delicious Tom Kha Gai, chicken in coconut soup! www.Amitathaicooking.com. In a country where you don�t speak the language it�s always a great idea to use tour services to get around and get the facts straight. 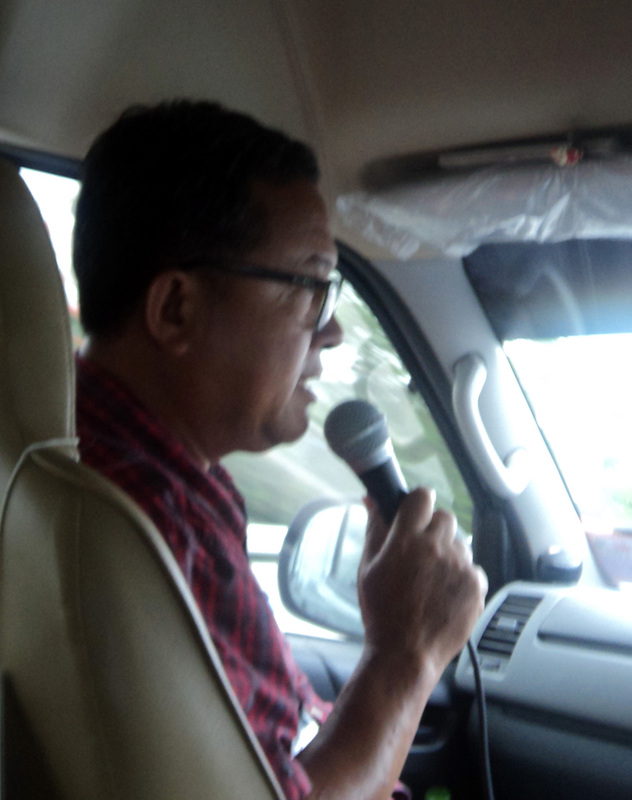 Our experience was outstanding with The Royal Silk Group. Their representatives took care of transportation, were outstanding tour guides, spoke English, and were all extremely charming and helpful. For information visit: www.royalsilkholidays.com. Our guide in Bangkok was really helpful, and so much fun! Use your tourism experts when planning your trip by visiting Thailand Tourism at www.na.tourismthailand.org. 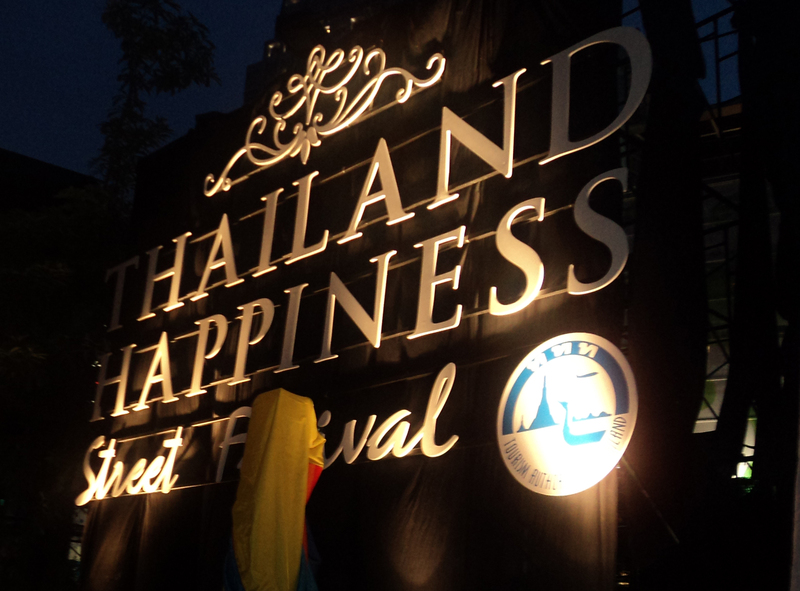 Look for Happy in Thailand Part II covering Chiang Mai and Samui next month.